I had the best afternoon! I am at our house in the mountains. The weather is beautiful. At 1 o’clock it was mostly sunny and in the mid 60s. As I sometimes do when I’m here on Friday’s I decided to take the afternoon off to paint. I had lunch outside on the deck and then decided it was so nice I had to plein aire paint. I decided to go to the Three Ridges overlook just up the road. 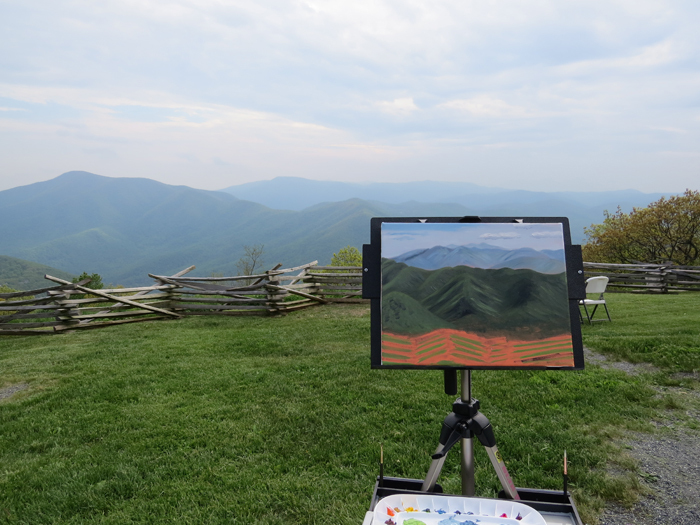 I drove up there, set up, and started painting. Not too long after I got there a woman showed up and told me that they were about to have a wedding rehearsal there for a wedding tomorrow evening. I asked if I was in the way and she said she wasn’t sure. I’m sure she was worried about how her clients would react. We agreed that I’d move my car out of the way but not my easel since it was all set up for the scene I was painting. Obviously if the wedding party objected I would have to move. The wedding party showed up shortly thereafter. They were very friendly and seemed delighted that I was there. I think I added to the ambience of the experience. They watched me paint, took pictures of me painting. The father of the bride took a picture over my shoulder of the bride posing behind my painting. It was a lot of fun. They had their rehearsal. Since I was painting outside I was trying to paint fast so I made pretty good progress while they were doing their walk through and taking photos. They were all very complementary of my work, which was very nice. The father of the bride took my business card. I ask him to share some of the pictures they took. Hopefully he will. It clouded up and I was worried it would rain on me. After last weekend I know that’s a bad thing. I’d also lost my light so I packed up and came home shortly after they left. I’m going to have to finish it in studio from a photograph. Here is a picture of the unfinished painting on location. The chairs were added for the rehearsal. They were not there when I started. The mountains and sky are pretty good. The light had changed from when I started. The sun had come around and the mountains in the foreground were much hazier than earlier in the day. I still need to do the details in front. Now I feel I need to make it special since it was part of a special occasion. I will share the finished product.